Yesterday I joined Beth and the Seattle Plein Air group at the Japanese Gardens. 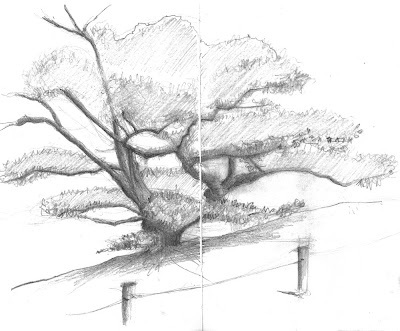 What a great way to spend a sunny afternoon -- the sketching was good, but even better was getting lost in the beauty of the trees and the fragrant blossoms. I have to say that the infinite shades of green were a little overwhelming, and the heat didn't help as I encountered challenges with my watercolor washes, but I found that focusing on a single bloom or intriguing color combination was a great way to engage without (too much) frustration. Anyway, I made a few studies, including the above pencil sketch, and really enjoyed the scenery. this is beautiful Joanna! i failed to email Beth back saying i wouldn't be able to make it but i'm really glad you guys went! Really lovely! You've caught just how peaceful the gardens feel -- in the shade! Thanks Gabi & Beth! We missed you there, Gabi, but we'll be sure to let everyone know about the next outing too.